Need a Tooth Extraction But Don't Have Insurance? Don't Worry, We Can Help! Finding yourself in the middle of a dental emergency can leave you feeling helpless, especially if it occurs outside of normal business hours. 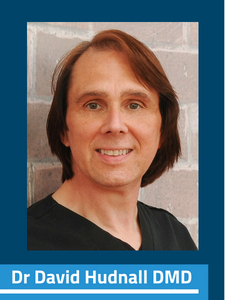 We partner with experienced dental professionals like Dr. David Hudnall to help you find the best possible care for your emergency and the most up-to-date information on any given procedure. This article will cover the most common questions people have about the emergency tooth extraction procedure. If you are experiencing severe tooth pain, it may be caused by a tooth that is broken, damaged, decayed, or which is crowding other teeth in your mouth. If this is the case, you may need a same day tooth removal, and you should speak to a dentist in your area about it as soon as possible. “Practically speaking, putting off treatment impacts your health, your well-being, and your wallet. Pain is the body’s way of telling you that something is wrong. Unlike many medical problems, dental problems don’t just ‘go away’ or resolve on their own – they generally get worse over time. If you’re not sure if you need this kind of procedure, or if you’re concerned about what to expect from an emergency tooth extraction, we’ve provided the following article to help you understand what to expect. And if you choose to set up an appointment using our toll-free helpline, we can point you to an emergency extraction specialist in your area who has been thoroughly vetted by both us and our expert dentists. 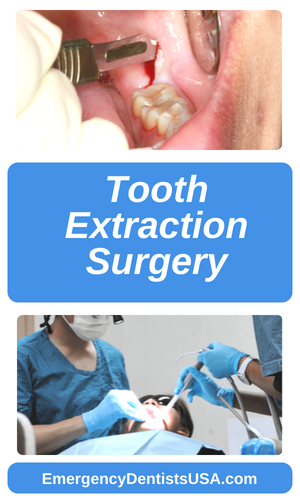 Asking yourself how to find a tooth extraction near me? We are a professional dental referral service that has spent half a decade specializing in connecting those in need of emergency dental care with dental practitioners in their area. No service has our connections with expert dentists all across the United States and our experience with finding 24-hour dental care for those seeking emergency tooth extractions. An emergency same day tooth extraction with no insurance is not a situation that any person wants to deal with. But the pain of an infected, damaged, or a cavitated tooth is too great to ignore. Each dentist listed on our website has years of experience performing these types or surgeries and will offer caring and customized treatment for your particular tooth problem. If you normally visit a homeopathic dentist you will most likely be referred to a traditional dentist or oral surgeon to have your tooth extracted. Since these are serious situations it’s best to have them handled quickly where additional medication can be administered if needed. A tooth extraction cost generally includes a thorough examination of the tooth, which will also involve the dentist taking an x-ray of the tooth and then determining whether this procedure will be a simple extraction or a surgical extraction. A simple tooth extraction is offered when the tooth can be seen in the mouth and when that tooth has too much damage for the dentist to repair it with a root canal, filling, or crown. The area of the tooth is numbed with a local anesthetic and the dentist uses a special dental tool called an elevator to loosen the tooth. A pair of forceps is then used to pull the tooth out of the mouth. Sometimes the gum is stitched closed using a type of suture that dissolves over time. A small piece of gauze is placed over the gum to control any bleeding. 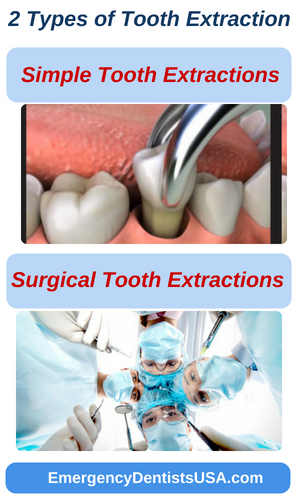 The cost of tooth extraction includes this type of care. If you have to have multiple teeth extracted you may find yourself looking at dentures or dental repair. There is emergency dental repair available to you if needed, just call our 24-hour hotline or talk with your primary dentist. A surgical tooth extraction occurs when a tooth has broken off near the gum or has not erupted from the gum. In this type of extraction, the dentist or oral surgeon takes an x-ray and performs an examination of the tooth. He or she then uses a local or general anesthetic to ensure that you are comfortable during the procedure. A small incision is made in the gum and the tooth is removed either whole or in pieces depending on its condition. To determine how much a same day tooth extraction costs, know that the price involves a process that includes several visits to the dentist in some cases. Prior to any tooth extraction, you need a thorough examination accomplished by your dentist or oral surgeon. Sometimes a patient might require antibiotics to control any infection prior to the extraction and may go home with antibiotics to ensure that no infection occurs following the procedure. The cost of the medications is in addition to the cost of the procedure regardless of which type of extraction your dentist chooses. Your procedure includes the use of a local or general anesthetic to make you comfortable throughout the tooth extraction. It’s tough to find an emergency dentist near you without insurance and it shouldn’t keep you from being healthy! 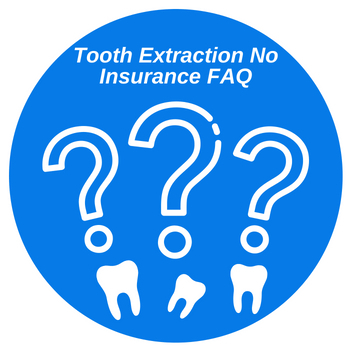 There are many reasons a person might have an emergency tooth extraction with no insurance. The cost of tooth extraction is often less than the cost of ongoing pain management when a person avoids routine dental care. A dental extraction might be necessary if a person has a tooth that has decayed beyond the point where a dentist can repair the tooth. The extraction could also be required for a tooth that is damaged due to trauma or broken in an accident. Crowding in the mouth might also cause a person to require a tooth extraction. Sometimes, as teeth grow, the baby teeth do not fall out or a tooth may crowd another tooth that is erupting through the gum. You might also require a tooth extraction if you require braces. A tooth might be removed in order to allow the orthodontist to straighten the remaining teeth. People who are receiving certain cancer drugs sometimes encounter dangerous tooth infections caused by the weakening of the immune system due to the medications. According to expert oncologists, patients who are receiving head or neck radiation might require teeth to be removed if they are in the field of radiation. Wisdom teeth, or third molars, are commonly removed to avoid impaction or over-crowding in the jaw. These teeth are often extracted when you are in your early 20s and can become very painful if they are decayed or affected by a cyst or infection. You will have to be sedated for this procedure by a sedation dentist or oral surgeon. Instead of searching, “Sedation dentistry near me” in Google, our services can help you find a sedation dentist near you. Regardless of the reason for the tooth procedure, the cost without insurance does not have to be painful. We offer a convenient selection of dentists who are available to perform that tooth extraction even if you do not have dental insurance. Tooth extraction surgery becomes necessary when you have a tooth that has not erupted through the gum or that has broken off close to the gum. In this case, an oral surgeon usually begins the procedure with an x-ray and examination of the tooth. He or she will then choose to use a local or general anesthetic to keep you comfortable during the procedure. A general anesthetic might include an injection given through a vein to help you to relax or even sleep through the extraction. This is most often accomplished when a patient has certain medical or behavioral conditions. The surgeon makes a small incision in the gum to remove the unerupted tooth. He or she might split the tooth into pieces to remove it. Sometimes a portion of the bone around the tooth is also removed to ensure that the tooth decay and infection does not spread to other areas of the mouth. An oral surgeon will prescribe a steroid to reduce swelling following the procedure in some cases, along with an antibiotic. It is important to follow your dentist’s instructions carefully to avoid any complications. If you can’t find a good dentist particularly on the weekends we can help you find a dentist open Sunday or Saturday. Our team of expert dentists works with us to create partnerships with dentists across the United States. Every practitioner we list has been carefully vetted and is someone who we have recommended patients to in the past and have had good experiences with. This convenient listing includes dentists and oral surgeons who accept patients who require a payment plan to have a tooth extraction. Simply scroll through our carefully chosen listing of oral surgeons and dentists, and choose the dentist who offers a payment plan that suits your needs. Most payment plans require no credit check and have little or no interest. The average cost of tooth extractions varies depending on several factors. The location and condition of the tooth are important variables to consider when you are estimating the cost of a tooth extraction. 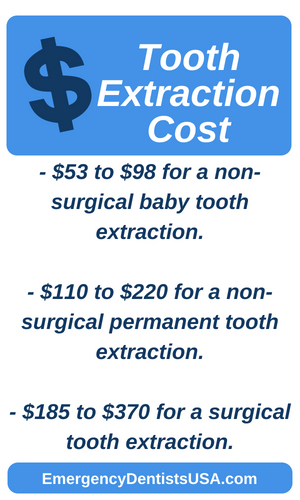 $53 to $98 for a non-surgical baby tooth extraction. $110 to $220 for a non-surgical permanent tooth extraction. $185 to $370 for a surgical tooth extraction. This does not include the cost of the initial x-ray and examination that was used to diagnose the tooth extraction, nor the cost of anesthesia. If an infection is present and additional medications are required, this cost can become slightly higher. Our referral specialists are highly-trained and have a lot of experience with a variety of dental symptoms. If you call our helpline, we can help you determine if your tooth requires an extraction or can be treated with a dental procedure like a root canal or a crown. However, you should only trust the official diagnosis of a recommended practitioner, which will most likely require an x-ray and a thorough examination of the tooth. How Much is the Average Emergency Tooth Extraction Cost without Insurance? According to the ADA, the cost of the average tooth removal with no insurance varies from about $53 to $370 depending on the location of the tooth, the condition of the tooth, and whether or not the tooth has erupted from the gum. Do I Need to Take Any Precautions Before Having a Tooth Removed? Yes. It is important to let your dentist know about your medical history and your current medications prior to the tooth extraction. Give your dentist a list of your medications and include the over-the-counter vitamins and supplements that you ingest. Let your dentist know if you are taking blood thinning medications or aspirin. The emergency tooth extraction with no insurance can be more complicated if you are on medications like blood thinners. What are the Risks that are Associated with a Dental Extraction? Some of the risks associated with a dental extraction include pain, swelling, or bruising at the site of the extraction. Another risk associated with a dental extraction includes delayed healing of the extraction site or even an adverse reaction to the anesthesia that was used to keep you pain-free. 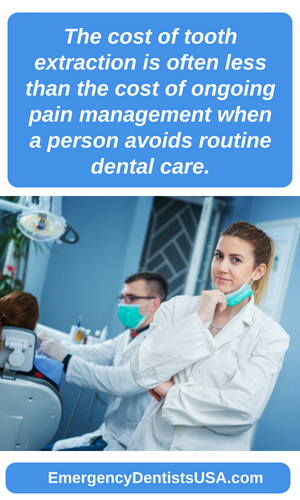 You might also encounter damage to the nerves or to other teeth; however, a 2017 study shows that these more serious symptoms occur in less than 4 percent of patients. Can I See My Regular Dentist for a Tooth Extraction without Insurance? Yes, most tooth extractions without insurance can be accomplished in your regular dental clinic. If your tooth is impacted or there is an infection present, you might be referred to an oral surgeon for the extraction. Many oral surgeons also offer payment plans for patients who are seeking an affordable tooth extraction option. Are there Follow-Up Procedures that I Will Need After My Tooth Extraction? In many cases, there are follow-up procedures that are required following an emergency tooth extraction without insurance. A dental implant, a dental bridge, or partial dentures are some of the choices available for patients after they have a tooth extracted.The procedure cost does not include the restoration following the extraction. Do I Need Someone to Drive Me to My Dental Appointment for the Emergency Tooth Extraction? Depending on the type of anesthesia that you require, you might need someone to drive you home from your dental appointment. If you are given general anesthesia, you might have dizziness or nausea following the appointment. An emergency dental extraction with no insurance does not require a driver if you are not given general anesthesia, unless you feel uncomfortable following the procedure. 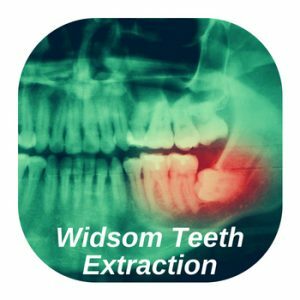 Can you help me find a tooth extraction? The dentist network does include dentists who have low cost teeth extractions. Each individual and location is different so please call to find out more. What sort of tooth extraction options exist? There are various ways to make a tooth extraction cost less?. The best way is going to be using a payment plan with a local dentist. These plans are usually low or no interest for at least 6-12 months and give you the chance to pay the extraction off over time. Are there free tooth extraction options? We don’t personally have any dental partners in our network that will provide free tooth extractions but you may be able to find a local non profit medical center that can help give you free dental work. A tooth extraction with no insurance does not have to be a painful experience for your mouth or your wallet. We can offer you an extensive and thoroughly-vetted listing of dentists and oral surgeons who can accomplish an emergency tooth extraction with no insurance necessary. Many of these dental clinics offer patients payment plans that are low interest or no interest. Whether you choose an oral surgeon or a regular dentist, an emergency tooth extraction with no insurance is much less painful than the suffering that you experience when you avoid this simple dental procedure. Local Tooth Extraction Dentists, No Insurance Required! - Click to Call!